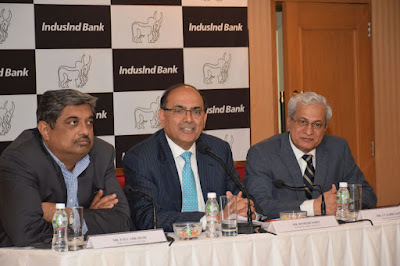 Mumbai, January 10, 2017: The Board of Directors of IndusInd Bank Ltd. today approved and adopted its Unaudited Financial Results for the third quarter, ended December 31, 2016. · Net Interest Income (NII) for the quarter is Rs. 1,578.42 crores as against Rs. 1,173.42 crores in the corresponding quarter of the previous year, registering a robust growth of 35 %. · Operating Profit for the quarter is Rs. 1,363.34 crores as against Rs. 1,060.98 crores in the corresponding quarter of the previous year, showing a growth of 29 %. · Net Profit for the quarter is Rs. 750.64 crores as against Rs. 581.02 crores in the corresponding quarter of the previous year, showing a growth of 29 %. · Net Interest Margin (NIM) for the current quarter is 4.00% as against 3.91% in the corresponding quarter of the previous year. · CASA (Current Accounts- Savings Accounts) Ratio improved to 37.04% against 34.98%. · Total Advances as on December 31, 2016 is at Rs. 1,02,770 crores as compared to Rs. 82,167 crores on December 31,2015, recording a growth of 25 %. · Total Deposits as on December 31, 2016 is at Rs. 1,19,218 crores as compared to Rs. 86,423 crores on December 31,2015, up by 38 %. Total Business at Rs. 2,21,988 crores. · Net NPA as on December 31, 2016 is at 0.39% as against 0.33% on December 31, 2015. · Increase in network to 1,075 Branches and 1,960 ATMs as on December 31, 2016 as against 905 Branches and 1,621 ATMs as on December 31, 2015. · Net Interest Income (NII) for the 9-month ended December 31, 2016 is Rs. 4,395.15 crores as against Rs. 3,248.36 crores in the corresponding period of the previous year, registering a robust growth of 35 %. · Operating Profit for the 9 months ended December 31, 2016 is Rs. 3,878.78 crores as against Rs. 2,990.23 crores in the corresponding period of the previous year, a growth of 30 %. · Net Profit for the 9 months ended December 31, 2016 is Rs. 2,116.28 crores as against Rs. 1,666.10 crores in the corresponding period of the previous year, showing a growth of 27 %. · Net Interest Margin (NIM) for the 9 months ended December 31, 2016 is 3.98% as against 3.82% in the corresponding period of the previous year. Commenting on the performance, Mr. Romesh Sobti, MD & CEO, IndusInd Bank said, “This quarter, post the historic move of demonetisation, the economy has been in a reinvention mode. Banks have taken various measures to help customers during these times to ensure a smooth transition. Adaptability, responsiveness and reinvention have become the new mantras of today’s businesses. Digitization which has always been in focus, has now become the core area of thrust. Against such dynamic changes in the economy, the Bank has maintained its sustained financials with steady numbers. The total business of the Bank has increased to Rs. 2,21,988 crores and we have maintained our NIM at 4.00%.